There are two equally vital parts to any story: the part you see and the part you don’t. The context and subtext. The story and the backstory. Whether you’re trying to figure out how to outline for NaNoWriMo (only one day away!) or just needing a game plan for your next work-in-progress, one of the most important considerations will always be backstory. Backstory isn’t always something we consider when talking about novel outlines. It’s not, strictly speaking, part of the story. It’s just stuff that happened in the character’s past. It’ll show up naturally when the time is right. No need to explore it before you start writing, in the same way you do the main plot. Well, that’s not necessarily wrong, but it is a mindset that can lead to a lot of missed opportunities. Backstory will influence everything that happens in your main story—from the plot events to the characters’ motivations to your ability to manage your thematic subtext. In short, it’s important. That being so, it’s definitely something to consider in your outline. It’s the story before the story. It’s everything that happened in your character’s past. It might even include his parents’ pasts, insofar as they have impacted the character himself, his childhood, his choices, and the life that has made him who he is when readers discover him in the Normal World of your story’s First Act. Everything that has ever happened to your character will influence the person he is. But does that mean every little bit of is important? Every childhood baseball game, every zit in high school, every job interview? This is an easy pitfall to fall into. You’re supposed to discover your character’s backstory, so you sit down and start writing about all the stuff that happened to him. But, frankly, most of that = snore. The only backstory that matters is the backstory that influences the main story. If your character suffered a brain injury after being hit in the head with a baseball, then his childhood games are important to his backstory. But if he just liked baseball? Nope, probably not going to be important enough to bother outlining, much less including in your story. So how do you decide which parts of your character’s past are important? How do you create a backstory that is not only interesting, but that actually brings depth and weight to your main story? There are only four questions you need to ask yourself to find your story’s best possible backstory. 1. What Brought Your Character to the Beginning of Your Main Story? First, consider your character’s physical surroundings upon his entrance into the story. What brought him here? There are two different sides to this, which may or may not both apply to your character’s situation. What Brought Your Character Here Purposefully? What reason does your character have for being present when the main conflict kicks off in your story’s Inciting Event? Was he aware of the coming conflict prior to its initiation with the other characters? Did he have a desire and/or goal that prompted him to want to engage with the conflict? Or perhaps he wanted to try to stop it? Either way, if the character has a conscious reason for being present when the conflict begins, there’s always going to backstory behind that. What brought him to this point? What made him aware of what was happening? For Example: In my dieselpunk/historical novel Storming, the biplane-pilot protagonist Hitch Hitchcock enters the sphere of the main conflict when he returns to the Midwestern home he fled years earlier. There is important backstory both in his initial reasons for having left home (the law was after him) and his decision to finally return (he needs to win the big airshow that has come to town). What Brought Your Character Here Physically? Your character may also be an unwitting participant in the initial conflict. She’s walking along, rather clueless, just minding her own business—when, wham!, the conflict sticks out its foot and trips her. But she had to have a reason to physically be in this particular space. Why is she here? What (seemingly?) unrelated goal is she pursuing that serendipitously leads her to this particular place at this particular time? If you’re allowed one major coincidence in your story, this is it. Still, it’s best if you can come up with solid cause-and-effect for why your character just happens to be in the wrong place at the wrong time (or perhaps it’s the right place at the right time?). For Example: In Storming, Hitch first brushes the main conflict in the Hook in the first chapter when two people fall out of the clear night sky right in front of his biplane. The immediate backstory answers the question of why he happens to be out there flying around in the dark (testing a modification on his plane), as well as why these two falling people are out there (SPOILER!). 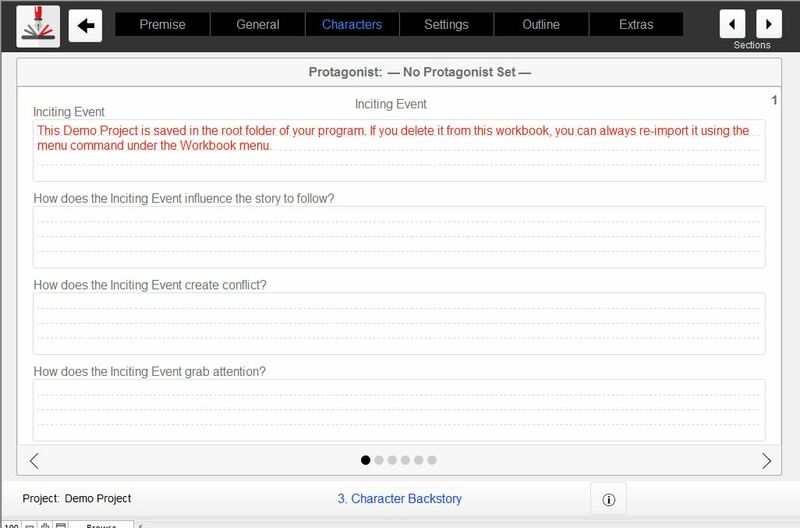 There’s a whole section in the Outlining Your Novel Workbook software to help you work through important backstory questions. 2. What Is Your Character’s Motivation? Arguably, the most important discovery you can make in outlining your backstory is that of your character’s motivation. What does he want in the plot? What is the Thing He Wants from life? And what related goal is powering him through the main plot? And, most importantly of all, why does he want it? Think of backstory as the cause to your main story’s effect. If the main story is the what, the backstory is the why. This is a crucial pairing. It is creates the illusion of realism within your story world. Without this all-important motivation in your character’s backstory, the verisimilitude of the story falls apart. In real life, people never pursue things without reasons. We get up to get a drink of water because we’re thirsty. We buy someone a gift because we love them. We rob banks because we’re poor… or greedy… or adrenaline junkies. There’s always a reason. Sometimes, your character’s motivation will arise from within the story itself. He becomes paralyzed at the First Plot Point, which initiates a motivation and a goal he never had to even think about prior to this event: learn to walk again. But even in these instances, it’s best if the character’s new goal is grounded in a deeper reason within his past life. Indiana Jones has no goal or motive to pursue the Ark of the Covenant until he learns of its existence, but his reasons for being in a position to go after it—the reason he is an archaeologist/adventurer—are deeply rooted in his existing life and (as we discover in The Last Crusade) his childhood relationship with his father. Indiana Jones’s motivations for becoming an archaeologist go all the way back to his childhood, as we finally discover in his backstory in The Last Crusade. For Example: In Storming, Hitch meets one of the people who fell from the sky—the mysterious and unpredictable young woman Jael—and agrees to help her return to what she insists is her home in the sky. Prior to meeting her, this goal was nowhere on his radar, but his motivation is grounded in both his preexisting goal of winning the airshow (Jael agrees to wing walk in his act as part of the deal) and out of his own longstanding, if conflicted, relationships with people (wanting to help them, but afraid of getting tied down—which is why he left his hometown all those years ago). Your character’s primary motivation for pursuing the main story goal may also be deeply rooted in events that happened prior to the beginning of the book itself. Almost always, you will want the Lie the Character Believes, which is at the heart of both the character arc and the theme, to be rooted in his past life (see the next section’s question about the Ghost). But the goal itself may originate prior to the story, only to be complicated as he engages with the obstacles of the main conflict in the Inciting Event and First Plot Point. If this is so in your story, ask yourself: Why did the character first conceive this goal? What prompted him to want it? What’s his motivation? What prompted him to transform his desire into action? For Example: In Storming, Hitch starts the story with the existent goal of winning Col. Bonney Livingstone’s famous air competition, so he can earn enough money to start his own air circus. This is the Thing He Wants, which provides the frame for his actions throughout the entire story, even before he gains his main story goal of helping Jael. 3. What Is Your Character’s Ghost? What creates character motivation within your story? Even more to the point, what creates a character motivation that is pertinent to your main conflict? Look no farther than the Ghost. The Ghost is the single most important event that has happened in your character’s life prior to the main story. In some ways, it’s even the reason the main story is happening at all. If you know nothing else about your character’s backstory, at least know the Ghost. It will influence every decision you make about your story, from character motivations to plot goals to thematic principles. The Ghost is the wound in the character’s backstory. It is the reason he clings to the Lie He Believes. It can be something deep and dark (such as the murder of a loved one) or it can be comparatively small and normal (such as a disapproving parent). Whatever it is, it’s at the root of your character’s motivation and, by extension, the Thing He Wants and his very plot goal. The Ghost is what ensures your backstory is not a random history attached to your character just to make him seem more “rounded.” The Ghost is integral to the main story. It is what creates your character’s subtext. Fail to understand your story’s Ghost—or, worse, fail to give your character a backstory Ghost that actually matters to the main conflict—and you will lose the all-important cause to your story’s effect. For Example: In Storming, Hitch’s Ghost is his broken relationships with his family—his dead wife, his wounded brother, and his embittered sister-in-law. He wants his remaining family to understand why he had to leave (because a corrupt sheriff was on his tail), but he’s still hung up on his own fear that responsibility and relationships will destroy his independence. 4. Which Backstory Revelations Will Advance the Plot? Once you’ve explored the above questions and gained a complete view of your character’s past, why she is the way she is, and what will make her react to your main conflict the way she will—your final step is to figure out how you can also use all this juicy backstory stuff to power the main plot. At its simplest, backstory will provide only the necessary context for your character’s motivations. But you can up the ante by using the backstory itself to power the plot through discoveries and reveals. What can your character discover about her own past that will move the conflict? What can she discover about other characters’ pasts? What can other characters discover about her past? And what can be revealed to readers at strategic moments that will pull them deeper into the story? Write a list of all the juicy stuff you’ve discovered in your character’s backstory. Now consider: how can you use these things to create mystery and to pull readers along? Instead of simply telling readers all about the backstory upfront, how can you uncover it, bit by bit, at strategic moments throughout the story, in a way that advances the plot? You know something advances the plot when it changes the conflict. Its revelation either allows the character to move forward in informed ways, or it throws up obstacles she must then figure out how to overcome. This is backstory’s most delicious role in any story. For Example: In Storming, Jael’s mysterious origins are only slowly doled out throughout the story. As Hitch discovers more and more about her backstory, he is drawn deeper and deeper into the main conflict of helping her get home before her pursuers can destroy his hometown. Brainstorming backstory is always one of my favorite parts of the outline. You never know what intriguing possibilities you will discover in your characters’ pasts. Often, you will learn things you would never have guessed, and which will then take the story in exciting new directions. It’s important to note backstory is not your story. It is only a tool to advance the main story. It is almost always at its most powerful when used with restraint, when it is allowed to remain largely subtextual. Some writers end up writing pages upon pages (tens of thousands of words, even) about their backstories. Nothing wrong with that, but always remember backstory’s purpose within your story. Don’t allow yourself to become so infatuated with your characters’ pasts that you allow them to overshadow the all-important present in your main story. When the time comes to sow your backstory into your main story, remember this rule of thumb: Only share backstory if and as it becomes necessary to either advance the main plot or allow readers to understand what’s happening. Now have fun digging into your characters’ fascinating pasts! Stay Tuned: Next week, we’re going to talk about how to weave all of your story pieces together into a cohesive whole. Wordplayers, tell me your opinion! How will your protagonist’s backstory affect the main plot? Tell me in the comments! Okay, so I think I’ve got pretty solid backstories for a few characters. Now it’s just a matter of figuring out how to spoon-feed them throughout the main plot. Yes, if anything the hardest part of backstory is figuring out how to actually use it in the main story! My rule of thumb is never to share the backstory until the moment it’s crucial to either moving the plot or helping readers understand what’s going on. I’ve a feeling I need to do some rewriting. Thinking about my characters’ back story have me key elements of my main story. Because I just selfishly wanted Pin to be a WW1 pilot I had to come with reasons why he ended up where he did. And Jack needed more than his uncle’s murder as a reason to keep running. Sure, there was Pin, and the angry tree, but why run, why not fight? Knowing Jack’s early life gave me the answers. Some of this will come out explicitly, but mostly the reader will just pick it up from attitudes and offhand remarks. I hope! I love subtextual backstory. When it works, it’s often the most powerful part of the entire presentation. 1.1 Purposefully – Abe and his father move from town to town to conceal an important relic. Abe is not aware of this, he just thinks his father is a transient. 1.2 Physically – Abe is minding his own business just wanting to get home from a normal day at school when he and his father are attacked by a monster. 2.1 Motivation from within the story – Abe has been attacked and drawn into this other world he never knew existed. And it all seems to centre around this relic. So he’s treading water trying to deal as things keep happening. At some point he decides to happen back. 2.2 Motivation from the past – Abe’s bond with his father, and the realisation that he had his old man pegged wrong all these years. He is motivated to honour his father’s work and take up the baton. 3. Abe’s Ghost is probably that same relationship with his father. His mother died in childbirth, and Jack is all Abe’s ever had. Couple that with a nomadic existence, and his father (and by extension, his father’s life mission) is Abe’s driving force. j-z. A bunch of stuff I’ll reveal in later books in the series. Great approach in making sure there’s motivation both in the backstory *and* in the main story. A character’s primary motivation can be influenced by the backstory, but must ultimately be incited within the story itself. I’ll have to be careful here as I have a lot of backstory worked out for the Jane novels, although some of it never makes its way into the plot. I don’t just have engineering drawings of my spaceships, I actually have wiring diagrams. You are right about the backstory that matters. I try to know it all, but include the bare minimum that will let the reader know what is happening and why it is so important to the characters. For example one of Jane’s earlier lovers was shot by his father, just after she had taught him how dance “Farmer’s Daughter” with her. Now she’s trying to teach the same thing to someone else. Alan reached into an inside pocket. Slowly he drew out an envelope from which he took two tickets. He held them up for Jane to see. ‘Don’t worry. You won’t be the first partner I’ve taught to catch me. It’s fun—’ she stopped suddenly. ‘No, nothing.’ Suddenly she was in the rooftop ballroom again, teaching Andrew to catch her. And then Andrew was burned and bleeding on the hangar floor as she knelt beside him, his father staring mad-eyed at her over the sights of an energy weapon. ‘Nothing at all, let’s go.’ She picked up her shoulder bag, and skipped down the steps. She saves Andrew by applying CPR after the energy weapon shot stopped his heart. Now she’s afraid the same thing will happen to Alan. Oh dear. Alan looked at her, his lips moving as he tried to form words. Then for a moment he seemed to be at peace. ‘Green and gold,’ he whispered. There must be something she could do, some way she could stop this, drag him back to life so that she could put everything right, unsay what she’d said, give him all the things he’d dreamed about. But there was nothing, and at twenty-five minutes past midnight, on a cold, wet morning, while Jane knelt beside him on the bloodstained deck plates of her ship, Alan slipped from her and died. OK, I’m perfectly horrid to my characters, and in the afterlife Jane will come after me with a gun. Nice use of a brief flashback too. Anyone know why the Oct. 9 episode “Start Your Outline With These 4 Questions” is the last one to show up in the iTunes feed? None of the newer ones are showing. That’d be because the RSS feed is broken and I’m having trouble diagnosing the issue. Tried something new today, so we’ll see what happens. The joys of coding! So sorry for the inconvenience. Yay! For once it’s not me! Of course the alternative–not including enough backstory–is equally dangerous, as backstory is an important part of character building and not knowing anything about the characters’ previous lives might make the characters blend together too much. Anyhow, this post is a great reminder to me of when backstory is not only appropriate, but necessary. So thanks! As important as backstory is, I’d always say err on the side of less rather than more. True enough, backstory is actually the WHY behind it all… even if it’s a huge challenge to use only the right amount. For the record, there is always one thing to do with backstory that doesn’t “make the cut,” and that’s to borrow from the filmmakers: write up your “deleted scenes” and “background material” and put them somewhere besides the story itself. Just like directors discovered that DVDs let them attach those extras on the disk’s submenu (so they don’t slow down the main story), we can fill up our websites with supporting material for the more interested fan– and sometimes write pieces of it up in bonus stories too. One thing I like to do is keep a separate “deleted data” folder. A lot of darlings end up in that thing. I think some people enjoy reading it although I get very few comments. Yes! This often makes a really nice “bonus feature” for readers. I revisit back story a lot during the writing of a novel because I often run I to conundrums that I’ll figure out from assessing the main story and the back story and tweaking both to iron out the wrinkles. As good as that is, I often find myself getting a little carried away and discover things within the back story that are really cool. Like the good bower bird that I am, nothing gets junked. Ideas get filed away because I know that there is a potential I’ll use them in the future. But yes, back story and main story are, for me, equally important and they remain malleable throughout the course of a project. I’ve had my backstory run away with me on more than one occasion. But better to have more than you need than not enough. Never know when you’re going to find *the* treasure amongst the surplus. Interesting. I’m quite the opposite, I try very hard not to change the backstory once I have started because of the risk of being inconsistent. For example there are several references to “artificial gravity” in the Jane novels, and the problems it causes. When the story is reaching the climax and Jane has defeated Arthur, but they are both in a crippled spaceship falling into the sun, it is the property of AG that has caused trouble up to now that saves her life. Yes, I do too actually, which is one reason I like to plot out my backstory as thoroughly as possible *before* I start the first draft. Listened to this one on Monday and haven’t had a chance to come back and comment ’til now. As always, I loved it!! It got me thinking about how I can explore my high school characters’ relatively-limited backstory more in depth (just for me) so that I as the pilot of the story don’t feel lost when there’s dark storm clouds of buried anger, regret, or even rainbows of lessons learned shining in the clouds. I have to be able to navigate my readers through my character’s reactions Even if a lot of their motivations stay subtextual and unspoken, *I* need to know *exactly* why they do the things they do. Because if I don’t, that’s where the main plot’s realism starts to unravel and feel forced. A lot of writers will write short stories about their characters’ backstories, just to help themselves explore it. It’s a fun way to find the characters’ voices as well. I do this. I also write “Test Strips”, a term I borrowed from film making. These are little cameos, what would this character do if they got a ransom demand, or there was an explosion, or they found out someone was lying? It’s also fun to run through the cast and ask how they would react. Jane: There may be another, everybody down! Eva: Oh no, no. What am I supposed to do? Ian: (Gun in his hand) Which bluidy sassenach planted that? Morris: (Into starline) Casualties four, two critical, I’ll need a surgical team to teleport down stat! Lucy: Oh no! They’ll expect me to pay for the repairs as well. That’s fun. I sometimes use this, in a very limited way, to compare various characters’ reactions and discover their differing motivations and personalities. I haven’t started writing the back story on the work I’m writing now. I have seriously thought about it though. The protagonist is a rugged hard-working firefighter who takes a cavalier approach to the women in his life. That all changes when a woman enters the fire station on the arm of another man who is applying for a volunteer fire fighter position there. He slides down the pole and knocks her flat on her behind. He’s not in love yet, but is immediately ‘intrigued’. They have a lot in common, but he doesn’t realize he needs more substance in his relationships with women until he confides in her why he lives in a $90,000.00 home he didn’t pay for. It turns out his ex-fiancée left him at the altar. Her father’s wedding gift was the house. Okay, now how do I reveal this back story through a heart to heart conversation with the new woman he now adores, through a talk in the mirror to himself, or perhaps through a third person omniscient narrator? Great post, as always. Hint at the backstory early on. Mention his house and the discrepancy of his living there. Hint at his broken heart, etc. But wait until the moment, deep in the story, when this info will influence his relationship with his new woman in some important way. Let her learn about it alongside the readers–either from the protagonist or from someone else in a way that is perhaps damaging to him. Thank you so much K.M. What superb ideas for my back story. I absolutely love the suggestion of having her learn from someone else ( I think I’ll choose the ex-fiancée’) . It will damage him and his new relationship since now she wants him back because she sees that he’s falling for someone else. She’ll expose the fact that the house was a wedding gift and that he’s still living there as ammunition to his new girl. I thoroughly appreciate that you took the time to help me along with so many other writers. You truly do help writers become authors. Love, love, love your leadership! “Reads the section about the Ghost.” Phew, looks like I haven’t neglected this part. In my first book the primary protagonist’s ghost is an incident in the past when she got hit with a really bizarre curse that almost caused her superiors to pull her from the field (she’s an assassin for a religious order). Almost everything she does is motivated by the desire to amass enough backing and cred in the Order that she won’t have to worry about being benched. My secondary protagonist grew up fourth child of her noble family. She had her duties, but she expected to live her life the way she wanted to. Then her three older sisters deserted the family for a life of adventure, leaving her the sole heir. That’s her ghost. Writing the second draft of the book has been headache-inducing since I wrote the first draft before reading any books on outlining and structuring, but I’m glad to see I grasped at least one important thing on my own. As a reader, I’d be interested in *why* it’s so important to the first protag that she not get benched. Why does she believe that will be the end of a worthwhile life? She defines her self-worth solely through her work, and how well she can perform her assignments. That’s her Lie, but I’m still figuring out how to make her realize that in a non-preachy way. From the perspective of character arcs, the Ghost is whatever causes the Lie. What in her past gave her this perspective about self-worth? That’s probably her most pertinent Ghost. Her life was in the pits before she got recruited into the Order, so she’s obsessed about giving back, about proving herself worthy of this second chance. The Order has invested considerable resources into training her, to the point of investing her with a tiny sliver of their goddess’ essence. She feels that if she messes up enough to be benched, she’s failed her recruiter, her teacher, and her goddess. Like a Navy SEAL who messes up and gets put behind a desk as punishment. I’m still fine-tuning, since as I mentioned, I wrote the first draft before reading your books, so I hadn’t done character interviews or anything like that. Have you read Hugh Howey’s Wool trilogy? The second book is ultimately the backstory of the first. His series is a fantastic example of what you say: he doesn’t include too much backstory in his first novel, which is so good, you desperately want to find out more. And he then managed to make an entire second novel purely out of his backstory, showing how thoroughly he worked out that backstory before he wrote the first book. Brilliant. Ironic! considering my main story is about a character with a brain injury. I made it this far. Tried to get into character interviews came back here to find what I am missing. Characters lie. i will have a good conversation with one before I start, and flesh out their life’s highpoint real well. Then once they are on the toll road do they go left or right, no, they tumble off road and across the desert. They quickly tell you this is not a medieval fantasy its a gumshoe detective. Sure I tell them to straighten up but do they listen? And this damned secondary characters, always wanting the lime light. Putting their wants before needs and talk about back stories. The only thing characters do best, they fill those plot holes like storm troopers on a county road. Not always in line with the plot but boy they get filled. Sorry I am a Pantser, organizing comes in the rewrite, or some time after the first 50k mark. Once the characters settle down into a happy place. Thanks for trying.